Osteoarthritis is the most common type of knee arthritis. It is characterized by progressive wearing away of the cartilage in the joint. As the protective cartilage is worn away, bone is exposed, the knee becomes swollen, and activities become increasingly painful. Rheumatoid arthritis (RA), an immune system disorder where the body attacks itself and the joints, can also affect the knees. Depending on the type of arthritis, symptoms tend to gradually progress as your condition worsens, but they may suddenly worsen with minor injury or overuse. Some patients report long episodes of mild symptoms with sudden changes that increase the severity of their symptoms. A feeling the knee may "give out"
Pain with knee arthritis is usually worse after activity, especially with overuse. Stiffness is common after sitting for long periods. As knee arthritis worsens, symptoms will become more severe, especially pain, which becomes more frequent. Further, pain may become constant with or without activity. Being in your late 40s or older: Joints get worn over time. Being female: Osteoarthritis is more common and severe in women. Being overweight: Extra weight adds pressure on the joints and can make joint damage worse. In contrast, weight loss tends to reduce the severity of pain associated with knee arthritis. 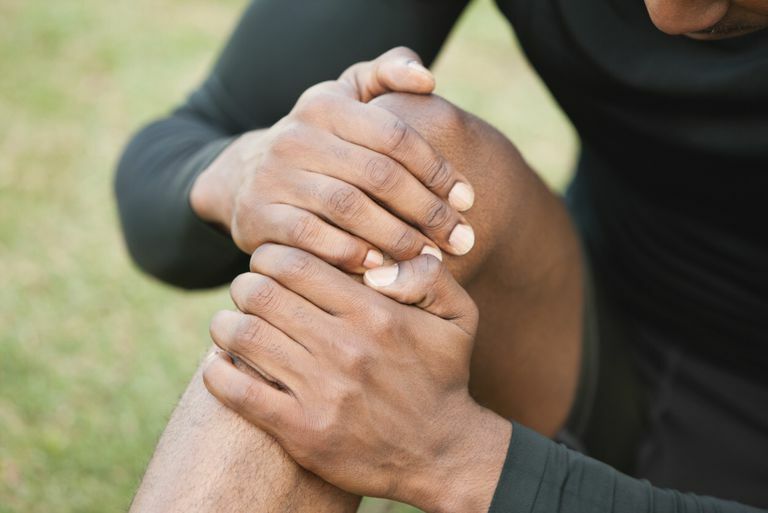 No single test can make a definitive diagnosis of knee arthritis, so doctors will use imaging studies, a comprehensive medical history, physical examination, and laboratory tests to come to this conclusion. Because most people over age 50 will have signs of wear and tear in their joints that can be seen on X-rays and have no symptoms, X-rays alone cannot always make a diagnosis. Instead, doctors may opt for magnetic resonance imaging (MRI), which can provide detailed images of bones, ligaments, tendons, and muscles. Unfortunately, MRIs are expensive and take time, so doctors usually do not utilize them unless they suspect something other than osteoarthritis. Lab work is helpful in diagnosing or excluding certain causes of knee pain, such as inflammatory arthritis. Lab tests may include blood work and knee aspiration, which involves taking fluid from the knee joint and examining it for abnormalities and infection. Depending on the type of arthritis, the goal of treatment is to provide pain relief, improve joint mobility and strength, control symptoms to the most possible extent, and prevent further damage to the joint. Treatment for the most common form of knee arthritis (osteoarthritis) falls into three categories: lifestyle, medication, and surgery. Weight loss: The less weight a joint has to carry, the less painful activities will be. Reducing pressure on the joint may also help your condition from worsening. Joint protection: This means using joints in ways that do not stress them. It could involve modifications in how you perform activities, changes to the way you set up your personal space, and the use of mobility aids. You can also protect knee joints by wearing comfortable shoes, eating the right foods to promote cartilage growth and keep bones strong, moving around and not sitting for long periods, and using a knee brace for support. It is also a good idea to limit certain activities, especially if they put pressure on joints. Exercise: Although it may seem difficult to think about exercising when you are in pain, regular activity can help you manage knee arthritis. Exercise can improve the strength of your leg muscles so they can better support your knees. Walking is great physical activity, but if that's too painful, try water exercises in a swimming pool. Physical therapy: Strengthening of the muscles around the knee joint may help decrease the burden on the knee. Preventing atrophy of the muscles is an important part of maintaining functional use of the knee. Hot and cold therapy: Alternating application of heating pads and cold packs can help relieve pain and inflammation in affected knee(s). Medication for treating knee arthritis may include anti-inflammatory medicines pain relievers. For the treatment of knee arthritis resulting from RA, corticosteroids or disease modifying anti-rheumatic drugs (DMARDs) may be prescribed to manage inflammation. Anti-inflammatory medications: Some non-steroidal anti-inflammatory drugs (NSAIDs) are available over-the-counter (OTC), such as Advil (Ibuprofen) and Aleve (naproxen). If your doctor thinks you need a stronger NSAID, you may be given a prescription for a COX-2 selective inhibitor, such as Celebrex (celecoxib). Other pain relievers: Another OTC medication, Tylenol (acetaminophen) can be used for pain management but does not help with inflammation. Prescription opioid analgesic medications are available for patients who many need stronger pain relief. Knee injections: Corticosteroid injections can help with reducing inflammation and pain quickly. Other injections include viscosupplements. The injections contain gel-like substances that can promote lubrication and cushioning similar to synovial fluid in healthy joints. DMARDs: DMARDs help preserve joint health by blocking inflammation. Without them, joint inflammation would destroy joint tissue within years and lead to disability. Knee arthroscopy is minimally invasive and involves surgical treatment using an arthroscope (optical device with a tiny camera) inserted in a joint with through a small incision. Additional incisions are made, as needed. The procedure starts with diagnosing the problem, such as misaligned kneecap or torn meniscus. Once the surgeon has made a diagnosis, he or she will repair the problem with small tools designed for grasping, shaving, cutting, repairing, and anchor stitching. A knee osteotomy involves cutting out a wedge from either the shin bone or thigh bone to realign the knee and offload pressure from the damaged portion of the joint. Doctors recommend this procedure to correct bowlegged alignment of a knee. Knee replacement surgery is among the most commonly performed orthopedic surgical procedures. With a total knee replacement, the cartilage is removed from the entire knee joint and a metal or plastic implant is inserted in its place. This way the bones of the knee joint are smooth so they can flex and bend freely without pain. Knee replacement can also be partial and involve replacement of only one part of the knee. Knee arthritis has no cure but it can be managed to slow down joint damage and reduce the potential for disability. If you think you might have knee arthritis, don’t delay in getting treatment. Work with your doctor and put together a treatment plan. Treatment goes a long way in keeping you active and having a good quality life.